WASHINGTON ― President Park Geun-hye said Thursday that both Korean and U.S. businesses could enjoy benefits of the Trans-Pacific Partnership if Seoul becomes a part of it. “If South Korea, which established free trade agreements with mega economic blocs like the EU and China, joins the TPP, it could deliver more benefits to companies from both countries,” she said in a speech delivered at the U.S. Chamber of Commerce in Washington. She was expressing her keen interest in joining the TPP for the first time amid skepticism building against the South Korean government for being hesitant in joining the U.S.-led trading bloc at the cost of weakening the global competitiveness of Korean exports. In a separate speech later in the afternoon, Park touched on the TPP again, saying South Korea welcomed the landmark deal and praising the trade bloc for potentially stimulating trade liberalization and economic prosperity. “Having already signed trade agreements with 10 of the 12 TPP-member countries, I believe that Korea is a natural partner for the TPP,” Park said in a speech at the Washington-based think tank Center for Strategic and International Studies. Her repeated remarks seemed to be sending signals to the U.S. to dispel concerns that Seoul is tilting toward Beijing both economically and politically. Local reports added fuel to criticism against the Korean government, alleging that Washington was disappointed with Seoul for not joining the deal but participating in a Beijing-led regional bank earlier this year. South Korean officials have been trying to curb such concern, pledging that they would strive to join the TPP in any form, after analyzing its impact on the national economy. Earlier this month, trade ministers of the U.S., Japan and 10 other nations reached a landmark deal to form the TPP, after more than seven years of negotiations. The trade deal, if endorsed by the legislature, will break down trade barriers of nations that account for about 40 percent of global gross domestic product. 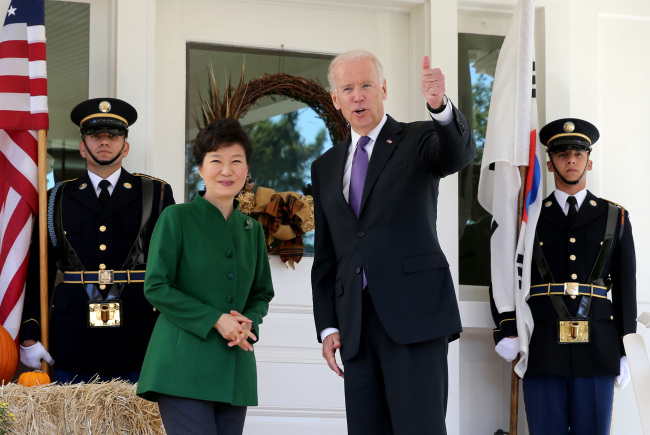 Aside from the TPP, Park also vowed to create a fairer and more transparent market environment to promote U.S. investment to Korea. Listing her efforts in overhauling the nation’s four sectors on the public services, labor, financial and education, Park said Asia’s fourth-largest economy is on the course of massive reform to eradicate abnormal market regulations and practices. She also urged the expansion of the bilateral partnership on creative economy, her vision of integrating technology with creative ideas, stressing that the two countries have sufficient capacity to lead the global economy if they work together. Since arriving Tuesday for a four-day visit, Park has been expressing hopes to expand cooperation with the U.S. in the space industry, particularly on Seoul’s plan to develop a homegrown space rocket by 2020. She also called for close cooperation in research and development and engineering, stressing that Seoul is seeking innovation in manufacturing.